Engineers at the University of California San Diego have created a unique robot that has the ability to move on surfaces like sand and rocks. It is able to walk on different kinds of rough surfaces and it can even overcome obstacles. 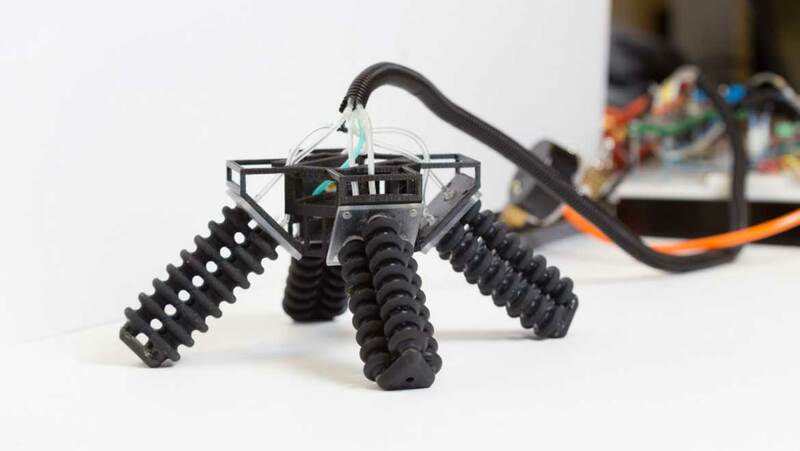 This little 3D-printed soft robot consists of four legs and is expected to be a part of search and rescue groups in dangerous and hard to reach by human terrains. It could also be used to capture sensor readings in high risk environments. A team consisted of researchers led by a mechanical engineering professor at the University of California San Diego, Michael Tolley, used a high-end printer that printed both stiff and soft substances into the same parts of the robot. As a result, the robot’s legs are considered a breakthrough with a unique, complex shape. The innovative idea of combining soft and rigid materials into the same component has made it easier to design a new generation of robots. They will be able to adjust and move with ease in an environment that a human being could never reach. This type of robot can also safely cooperate with humans and make their job a lot easier. The idea of the team is truly an inspiration, that is the blending of soft and hard materials into the robot’s body. Moreover, 3D-printing is far cheaper and faster than using molds. The soft robot was put to the test on large rocks, surfaces with gradient and sand. It was also able to crawl into a gradually confined space. A PhD student at the Jacobs School of Engineering at UC San Diego, named Dylan Drotman was the lead in designing the robot’s control systems and its special type of legs. He developed models in order to predict the movement of the robot and then analogized it with its actual reaction on a rough surface. The robot’s walking behavior in real life closely matched Drotman’s predictions. Each leg is made up of three parallel, connected sealed chambers that can be inflated, known as actuators. These are 3D-printed from a material that resembles rubber. The chambers are empty on the inside, so they can be inflated. On the outside, the chambers are bellowed, which allows engineers to better control the legs’ movements. For example, when one chamber is inflated and the other two aren’t, the leg bends. The legs are built in an X shape and are firmly connected to a stiff body. The robot’s walking motion depends on many factors, including the amount of pressure placed on it and the order in which the chambers in its four legs are inflated. The next step for the researchers is to make the appropriate adjustments to the robots legs and core so that the robot can walk independently. The challenge here is to find the right design such as power sources and batteries. Up until this innovative soft robot has ‘come to life’, soft robots have only been able to crawl on the ground without being able to lift their legs. This is what makes this robot so special. It is expected to make a difference in cases of rescues in areas that a man can access with difficulty or not at all. The soft robot was presented at the IEEE International Conference on Robotics and Automation from May 29 to June 3 in Singapore.